The British high street is changing faster than ever with the news that music and movie store HMV is to appoint an administrator, putting 4,350 jobs at risk, following the high profile recent failures of Jessops and Comet last year. But as more of these national brands close their doors, the question needs to be asked as to the causes. The most obvious cause for the change in fortunes for HMV is the rise of the internet, which has brought both the competition for physical sales from sites such as Amazon as well as mp3 downloads from places such as iTunes now making up more than 50% of the music sales each year in the UK. It is baffling as to why the UK’s largest music retailer for decades would actively ignore the growth market of digital goods, but that is exactly what HMV did for years. Apple was the leader, launching the iTunes store in 2003 as a way for people with GBs of music storage now in their pockets with iPods looking to buy music downloads. 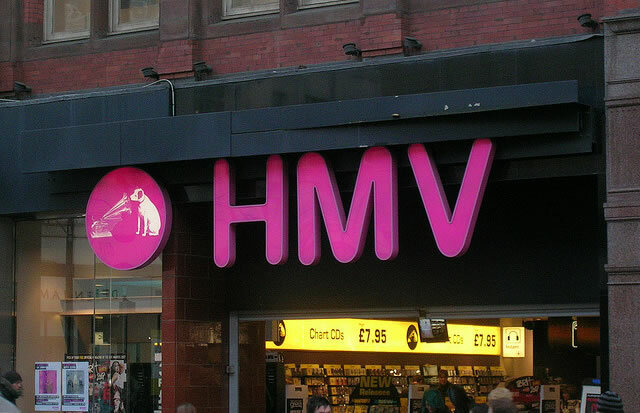 It then took HMV seven years to launch HMVdigital after buying a 50% stake in 7digital – the company that essentially provides the store before HMV rebrands it. 7digital launched in 2004, and HMV should have acquired it outright back then, or at least in 2006/7 when it was pretty obvious to everyone that digital music sales were the future and Amazon got in the game with AmazonMP3. Had HMV gone “digital first” back then by either devloping a solution in-house or just buying 7digital or similar then even as in-store sales were in decline, they would have had another growth area to rely on whilst they worked out the more difficult problem of how to adapt their stores to the changing marketplace. Along with the rise of the digital download, vinyl sales have continued to surge year after year as CDs decline. Vinyl is something precious to hold with large album art and produced in limited numbers. CDs were just physical packaging for digital music, and MP3/AC/FLAC/etc are just a more efficient way to get that digital music. Vinyl is something different. Did HMV see this growth market and decide to stock vinyl, or even offer true vinyl enthusiasts a way to interact with each other – possibly with a small vinyl exchange in the back of a shop? Nope. Just like digital, HMV ignored the continued resurgence of vinyl. It may be a niche product, but at least it is selling and would get people into the store where they could then try and sell them goods with higher markups. HMV launched back in 1921 and adapted from selling record players, to vinyl, to tapes, to CDs, but somehow forgot to adapt in the 21st century at all. Even back in the heyday of CDs in the 90s HMV was essentially a superstore with little in the way of style or culture – its stores were huge and they sold a vast array of music. It didn’t have the charm of individual record shops, and its staff were not that knowledgeable, but it was cheaper than the competition. With the arrival of Amazon and Play.com amongst others, HMV was no longer the cheapest around. Superstores on the high street cannot compete on price with superstores on the internet with cheaper real estate and less staff. As HMV lost the price war, it needed to adapt to offer music fans and casual shoppers a reason to choose them. It didn’t. The décor stayed the same, the soulless isles became ever emptier, and HMV started to focus on driving down costs rather than driving up footfall. The selection of music in their stores over the last few years outside of the top 40 has continued to dwindle, and the music they played in-store was the same rubbish you had just heard on Heart FM in the cab on the way. There were no independent music zines being stocked, and in-store shows weren’t showcasing new bands, they were simply established acts with CDs that everyone who would have wanted them would have already bought – where were the sales incentives? Then, as a last desperate measure, HMV changed its stores to offer electrical goods such as iPods and headphones in store – which would have been a reasonable change back in 2004, but those items are cheaper online and people don;t drop £200 on a new mp3 player on a whim. Music stores survive by getting people through the door, and then once their convincing them that they have heard their new favourite band and need to buy that record. Or where people go in to buy a present for a loved one and then just couldn’t help themselves and buy a whole bagful of record for themselves. They need to appeal to the whims of the buyer – and the buyer may spend £50 on music rather than £20 with some persuasion, they will not suddenly decide that they need a new mp3 player. Tax – An Even Playing Field? Whilst Amazon may have pushed HMV out of the market as the cheap superstore to buy CDs, it cannot go unnoticed that a good part of the reason for that “discount” is that Amazon does not pay UK VAT, instead funnelling its profits through Luxembourg. Play.com also managed to avoid paying UK VAT through a tax loophole for goods sold from the Channel Islands and pushed HMV aside – the profitability of this tax break could be seen only to clearly as Play.com closed its CD and DVD business recently to focus on its marketplace operation as that loophole was closed. The government seems so interested in promoting UK businesses, but by allowing these loopholes British businesses cannot compete and are suffering the consequences. Tax was not the only reason for the failure of HMV in recent years by any margin, but in business of sales volumes like these – the playing field needs to be levelled.